I have a full time job (since Dec 2012) therefore I don't get to do as much crafting as I used to. When I have time I make beaded ornament covers, pine needle baskets, crochet, embroidery, sewing, and whatever else crafty that interests me. I designed the pattern for the sleeve part of this ornament. My friend that beaded it designed the danglies on her own. If you are a beader and you would like to purchase a pattern ($12 each) I can do that too. Pin It Now! Hi Lady! These are beautiful! Learn something new about you everyday! I would love to hear from you! As with anyone I love to read your comments! I respond to them all, via email unless you are a no-reply blogger. If you are a no-reply blogger please leave your email address. Thank you for stopping by and looking! I reserve the right to remove any comments that I feel are inappropriate. 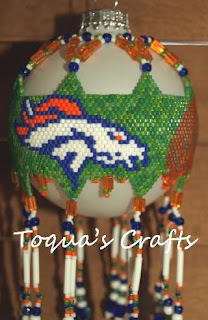 Visit Toqua's profile on Pinterest. My followers are so precious to me! THANK YOU!